This morning, popular food podcast The Sporkful is launching a special weeklong series called “Who Is This Restaurant For?” The new series covers the cultural signaling inherent in most restaurants, which use decor, prices, staff, clientele and the food itself to communicate which races and cultures will feel most welcome in their restaurants. In this first episode for The Sporkful’s new series on restaurant signaling, Pashman and special series co-host Kat Chow of the NPR podcast Code Switch venture into Washington D.C.’s restaurants to talk with owners and patrons. D.C. is a particularly interesting city in which to talk to diners, because it manages to simultaneously flow in coexisting layers and in virtual segregation. D.C. is rapidly losing its older African-American population, and gentrifying rapidly. It is a northern city, a southern city, and a global city. The podcast series features a wide range of luminaries in the food and entertainment worlds, including comedian W. Kamau Bell, Insa and Good Fork owner Sohui Kim, Dirt Candy owner Amanda Cohen, Busboys and Poets owner Andy Shallal, and Petworth Citizen and Room 11 owner Paul Ruppert. In candid interviews, they discuss the coding that restaurants silently speak, whether through ethnicities of hosts who greet you at the door or through where that host chooses to seat a customer. Busboys and Poets owner Shallal stresses that he trains his staff to see race instead of ignoring race so that they can be sensitive to potential issues. The Sporkful also chats with Todd Kliman, author of the article “Coding and Decoding Dinner,” which details Kliman’s difficulty over a decade in finding a publication to carry his piece on the racial dynamics and coding of restaurants, and what he did eventually find. 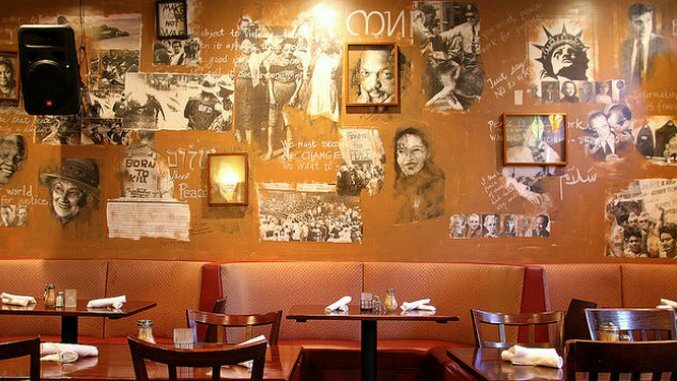 Kliman chats extensively with Busboys and Poets owner Shallal, and hopes that more restaurants will follow his lead of an extensive effort to make everyone feel welcome. Viewpoints in the podcast are not always in agreement, making for a more interesting podcast. Several interviewees were critical of Shallal’s utopic vision and what they believed to be false pandering. One interviewee questioned Pashman and Chow for even asking whether it was possible for a restaurant for everyone to exist, while another interviewee asserted that diners just want to be selfishly comfortable, not exploratory. The Sporkful has been examining the deeper issues surrounding food since earlier this year, starting with its series “Other People’s Food,” which examined cultural appropriation in food. The Sporkful host Dan Pashman also hosted an event during which he chatted with actress and activist Rosie Perez about food appropriation, taping live for the series. “Who Is This Restaurant For?” is a promising new series offering a wide array of viewpoints in the continuing conversation surrounding race, class, culture and food. Subscribe to The Sporkful or listen at WNYC.